If you asked me what my weekend looked like 10 years ago, even seven, I'd describe it like this. A few days in advance, I would scour the internet and newspapers trying to decide which restaurant to make a reservation at. There were many rules- it had to be one we hadn't visited before, it needed good reviews, somewhere close to a tube station, somewhere that served good honest food. That was all- we didn't ask for much! I'd get home from work early and have a long hot bath (read bath- not shower), put on my fancy date clothes, spend time doing my make up, the works. Me and Akber would walk hand in hand to the tube station, him holding an umbrella over my head (it ALWAYS rained in London), me clutching a tiny purse under my arm. We would talk hours on end, about our day, our work, our bosses, our life ahead. We would spend time looking through the menu, our fingers stopping to read each course. We ALWAYS ordered dessert, always. That was a given. Sometimes, we would just walk on the streets and casually walk into a coffee shop for a quick crepe, an ice cream, just coffee. People watch until closing time. Our weekends are quite a bit different now, not that I would have it any other way. Sometimes weekdays merge into weekends and I don't even realise what day it is. Except I find that my two kids tend to wake up earlier on a weekend. They just know somehow, you agree? The day is spent in and out of high chairs as we go from one meal to another. In between, I find myself cooking the next course. Meals are quick, messy, loud. There are normally four people all trying to have a different conversation but at the same time. Eventually me and Akber give up and then we watch, and listen, as Maryam and Hassan talk, scream, eat, make a mess, enjoy. The rest of the day is spent ferrying the children to different playdates, parks and birthdays. I usually grab the first outfit in my cupboard, there is no time for make up and my clutch bag has now been replaced by a larger contraption. One that houses a house literally. Trust me when I say I have EVERYTHING in my bag. It's just a question of finding it. We still walk hand in hand though. Except I hold Maryam's and Akber Hassan's. Eating out is a chaotic affair. We usually know exactly what we want to order and don't even require a menu. The staff generally know us, pretty well too. But like in the past, dessert is a must. Some things just never change. As you can tell, life has changed dramatically. and you know what, I love it. I do love this new life of mine, my family, the busyness, the chaos, the noise. All of it. But every once in a while, I crave some alone time with Akber, a date night if you like. On those rare and special nights, the kids are in bed early and most of the time, we would book a fancy restaurant. Occasionally though, I cook for us at home and it's usually like this. A quick juicy steak with mashed potatoes or fries, a little green on the side and a little something to jazz up the steak. Usually it's a creamy pepper sauce or a peri peri style one. This time, I opted for a zaatar butter. Laced with honey, it goes perfectly with the sharpness of the sumac and fresh herbs. A beautiful meal eaten with a beautiful person. Tell me, what special meals do you cook when dining alone with your other half? To make the zaatar butter, pound the sesame seeds in a pestle and mortar. Add the rest of the ingredients until salt and pound to make a rough paste. Add honey and butter and mix through. using cling film, form a sausage shaped roll about 1 inch think and refrigerate until firm. Brush both sides of the steaks with olive oil and season really well with sea salt and freshly ground pepper. Heat a grill pan on high heat until smoking. Add the steak to the pan and cook on each side for 3-4 minutes for medium rare (or to your liking). Place on a warm plate loosely covered with foil to rest for a few minutes. 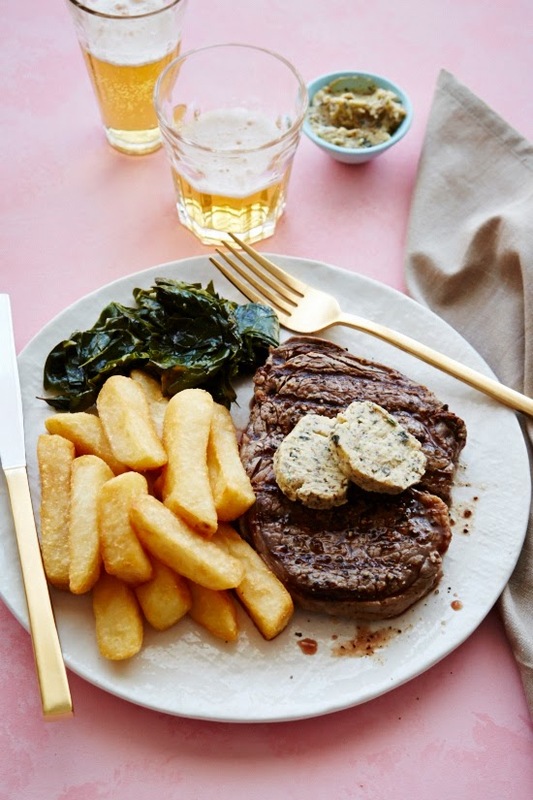 Slice the butter into rounds and serve on top of the hot steak with steak fries or mashed potato on the side. Note: Extra butter can be kept in the fridge for up to 2 weeks. Gosh, I can't imagine what it would be like with anyone other than my husband and I alone! I'm still in my experimental cooking stage, and the hubby loves any Asian food, so its usually lots of stir fries and Thai noodle soups. He also loves anything meaty (who's husband doesn't), so your recipe would be a winner. Making edamame soba noodles with hoisin salmon tonight! Scrumptious! That za'atar butter sounds wonderful. I loved your writing in this post - really personal and evocative. Sadly if we are home alone often I'll cook something for me and KP will cook something for him - we crave different foodstuffs. As a special meal cooked solely for him though, it has to be stuffed veg. Lovely story, normally I enjoy your photos more than reading, this kept me reading. Just lately myself mastered steak. Have to try your za'atar butter with it next time. We eat nowadays loads of salads and soups to keep it light. But always there is a dessert. This butter sounds incredible! I must try sumac. Thanks for the inspiration. You are so beautiful in your photograph, by the way! zaatar butter sounds very interesting. Enjoyed going through your photos and writeups. I love the sounds of this, and enjoyed your column with the recipe. I love making my husband traditional family recipes from his side or mine, sometimes with an adaptation for the way we now eat (read less sugar, less carbs, gluten-free). I have appreciate with getting lot of good wonderful recipes ! Thank you for sharing . I really liked this part of the article, with a nice and interesting topics have helped a lot of people who do not challenge things people should know, you need more publicize this so many people who know about it are rare for people to know this, Success for you. weblog includes remarkable and genuinely fine information in favor of readers. world besides that it is carried out on the cyberspace. Thanks for sharing this great information. It is in reality a great and helpful piece of info. Game online a lot of people who love to help them relieve stress of the moment, such as Tiny Tanks and Tiny Planes or Tiny Planes Beta is the fighting game with a pen or pencil, you have to destroy opponents before they kill you. Or Run 3 Unblocked and Hacked unblocked Gamesare skillful game controller for bears to dance to the goal without falling off a cliff. I wish you happy gaming! we celebrate friendship day on 1st Sunday of August..Friendship Day 2016 QuotationsIt is the connection between two people may b they are boys and girls, girls to girls or boys to boys. We celebrate friendship day on 1st Sunday of August Whatsapp friendship Day Status Friendship is a faithful and loyal relationship between two or more person living anywhere in the world. To Get Latest IOS version called IOS 10 Download free from CydiaNerd. Your website is really inspiring for me to achieve success, keep the spirit. Thesis the very humbled better sound and incredible! i'll be like that's your inspire.Your photographic was beautiful i'm love to your share photo. Want to know about Veterans Day,which is a day to celebrate the great officers of the US army,just checkout my blog Happy Veterans Day 2016 and stay updated. Cara Memerahkan bibir secara almi mudah dan cepat, cara mudah memerahkan bibir, cara alami memerrahkan bibir, kami menyediakan artikel Cara Memerahkan Bibir Secara Alami yang bisa anda terapkan pada malam hari, artikel cara memerahkan bibir secara almi paling cepat bisa anda coba setiap hari, adapun cara alami mencerahkan bibir ini sangat efektif karena bahan yang kita butuhkan bersumber dari alami, selain itu cara alami ini tak banyak mengeluarkan uang, melainkan cara penggunaan yang rutin setiap hari. I have been searching out for this similar kind of post for past a week and hardly came across this. Thank you very much and will look for more postings from you. I like play game five nights at freddy’s 4, game word cookies game , game word cookies answers , hotmail sign in and hotmail login, and u? I hope people visit my website. good upon the Mobdro application. Currently merely Download Mobdro for PC Mobdro supports Android 4.1 and also higher best. Obat Infeksi Pencernaan pada Balita, Anak-anak dan Dewasa Herbal, Ampuh Menyembuhkan Infeksi Pencernaan Secara Alami, Efektif serta Aman Tidak Menimbulkan Efek Samping. They have news articles written in intermediate level English which they read in two speeds: very slowly and natural speed. Thank you for sharing it. It's an amazing blog. Another way to make a familiar dish. I think it will be very attractive. I will do it for my family's dinner. Thanks for your guidance a lot!